Dorian Satoshi Nakamoto, the man who Newsweek identified earlier this year as the mysterious and sought-after creator of Bitcoin, has launched a website to collect donations to sue the magazine. Nakamoto, who Newsweek called out as the "face behind Bitcoin" in a cover story in March, has long denied that he had an involvement in creating or developing the cryptocurrency. The name Satoshi Nakamoto has been associated as the pseudonym for the person or people who developed the virtual currency. The report resulted in Nakamoto being stalked at his Temple City, Calif., home by reporters and then led to a comical slow-speed car chase in which he and an Associated Press reporter tried to outrun other journalists in pursuit of the story. 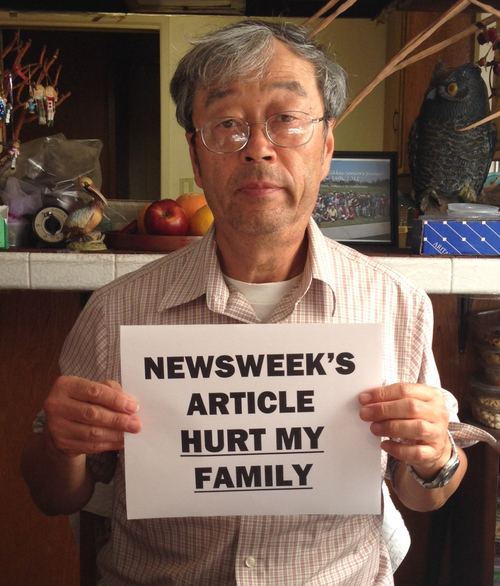 The fundraising page -- Newsweeklied.com -- describes Nakamoto as a 65-year-old engineer who continues to look for work after 10 years of unemployment because of "severe financial distress." The page goes on to claim that Newsweek's article caused chaos and confusing for his family, allegedly misquoting himself and members of his family and fabricating quotes. "In the chaos, his mother believed that the authorities were planning on removing her from her home to put her in a care facility," according to the webpage. "His estranged wife and children were alienated by the story, which portrayed a person and situation different from their understanding of their husband and father." Nakamoto has already received more than $20,000 in donations from sympathizers, mostly in bitcoin form raised during an online fundraiser to help him "with medical bills his family is facing, any legal bills they may incur, or anything else." While saying that Nakamoto was "extremely grateful" for those funds, the page says the funds raised in this effort will go toward paying the costs of suing Newsweek, which the page said should be "held accountable for its reckless reporting." Ethan Kirschner, Nakamoto's attorney, confirmed to CNET that the fund and website were "endorsed and authorized" by Nakamoto. IBT Media, which owns Newsweek, declined to comment on the matter.